Sakura Watch, April 17, 2017 - surprise! 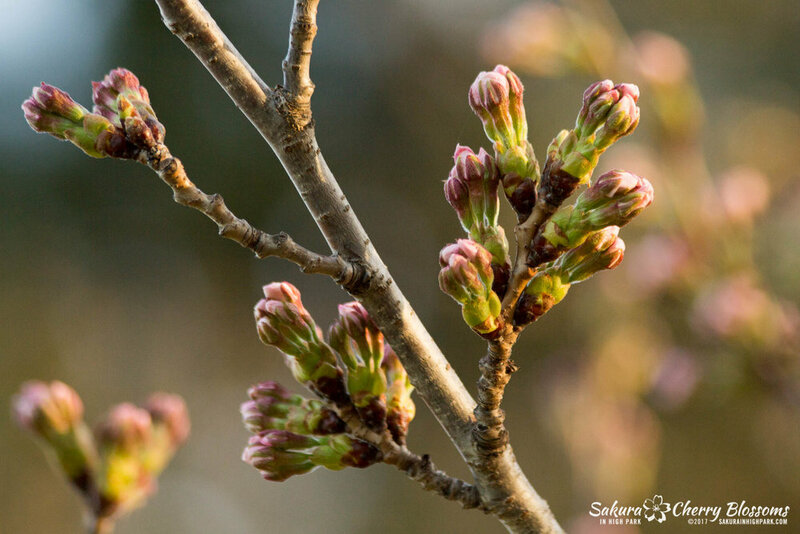 Cherry blossoms bloom begins this weekend as we see most of the buds florets emerging from the sakura buds! 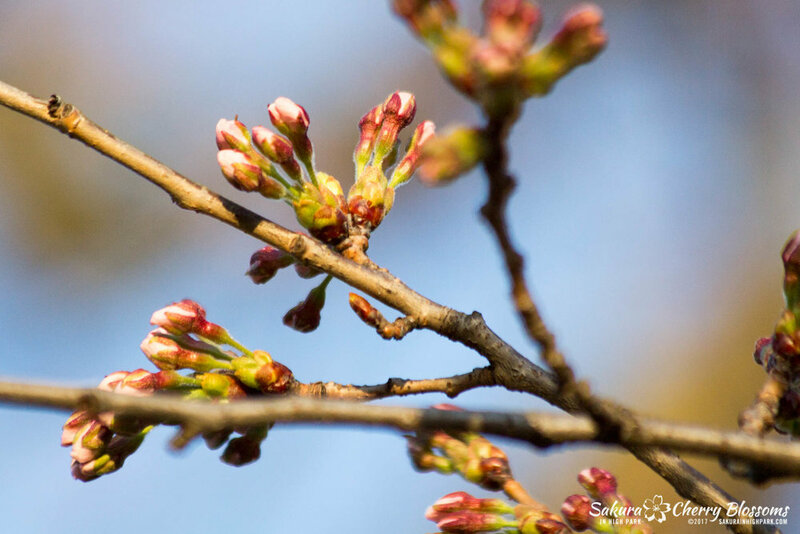 Call it an Easter miracle, a sign of climate change or an answer to wishes of thousands of eager Toronto blossom fans, the bloom date has yet moved up again to see a blooming start as early as later this week! Usually, as past predictions and observations have shown, moving from stages 3 & 4 into stage 5 and finally bloom traditionally require 16-21 days. This is the window of opportunity for the weather to co-operate with stable spring temperatures and essential blends of rain and sunshine. Last year extreme weather stalled the trees for so long they went to leaf. This year it seems the opposite bouts of above seasonal temperatures have turned the tables again. Near summer-like weather, this past weekend as accelerated the pace of bud development to the point where all the trees are now in a clear stage 5 of development! This stage timeframe usually dictates a full bloom could occur within 6-10 days. What will bloom first? Where should I look? My walk this evening saw a few trees with sure signs of being ready to begin showing at least a few cherry blossoms, possibly as early as Wednesday or Thursday of this week (April 19 & 20 respectively). 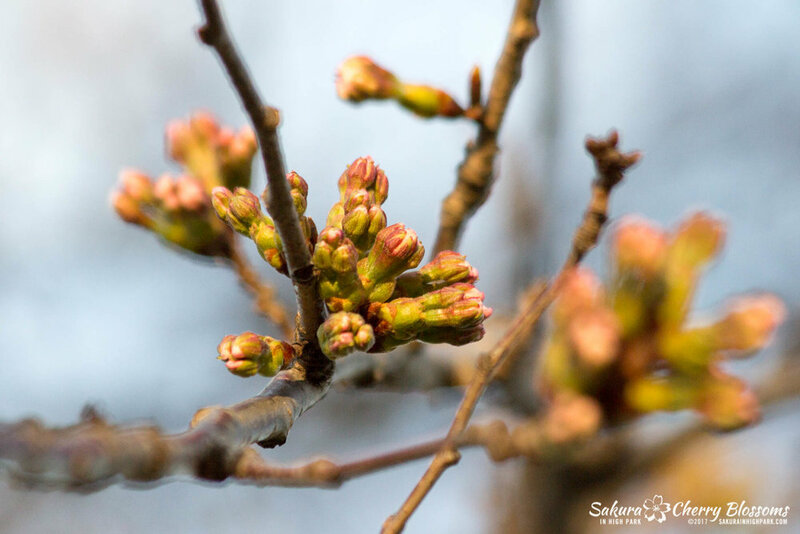 As is still the case, the trees located near the sports fields near the High Park Ave and Bloor Street entrance will be among the first to show signs of blooms. 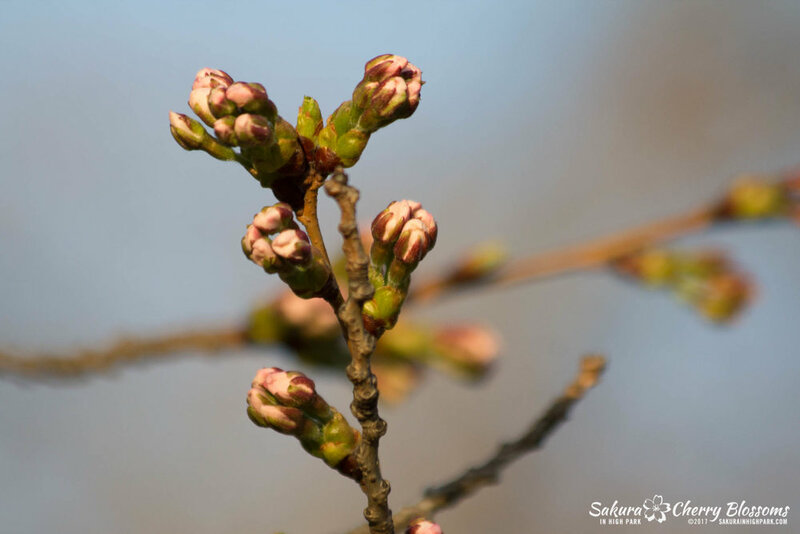 The real first bloom could be as soon as tomorrow on the one sizeable lone sakura tree resting on the hill (see photos in gallery) shows a hand full of florets fully extended, white petals in a ball just waiting to open up! I plan to be checking on Wednesday to see the progress and report back. The past few years have made it more and more challenging to get an accurate prediction date. Its become apparent this year that I will be looking closely at all the signal and signs of development and create new prediction models. Expecting the unexpected is now the new normal. Unpredictability has been exasperated with the constant fluctuations in temperatures and climate that the old schedules no longer can accurately predict blooms. It seems only continued on sight observation, as I've been doing, will be the only sure way to track how fast or slow the development of the sakura cherry blossoms will be. Watch for more updates in the next couple days.